What began a decade ago as an effective collaboration between a school board and its teachers has become a divisive tool enabling the Rancho Santa Fe superintendent to use the threat of expelling the children of teachers in their district if they will not agree to settle their contract. By using a sunset clause in current contract language, Rancho Santa Fe administration simply stalls negotiations to run out the clock and stipulates that if there is no settlement, Board policy 4111 will be void and teachers will be forced to remove their children from the Rancho Santa Fe School District. 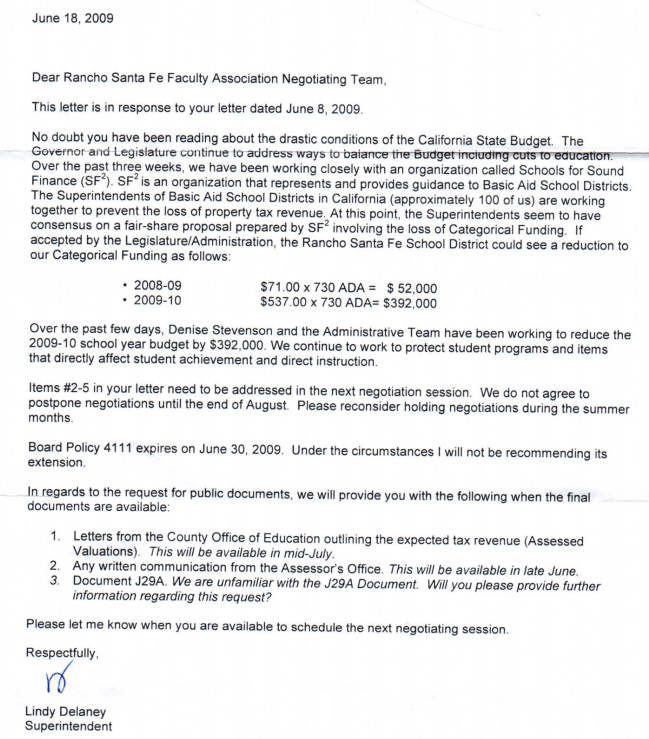 After years of interest, in the fall of 2005 a group of teachers and supportive parents approached the superintendent about allowing teachers to enroll their children in the Rancho Santa Fe Elementary School District (RSFESD). As the former Faculty Association President, Rancho Santa Fe Faculty Association (RSFFA) member Steve Rossier presented the information to the school board. Board Policy 4111 “Enrollment of Children Whose Parents or Legal Guardians Are Permanent Full-time Certificated Employees of the District and Who Are Not Residents of the District” was written and ratified in 2006. Initially, the teachers greatly appreciated the board’s recognition of this request by our teachers and understood it was extended as a privilege. The 2006 policy, however, was written with a “sunset” clause, making it no longer valid after three years unless the board votes to renew it. This would coincide with contract negotiations- agreements have been of equal length. Unfortunately during the Great Recession in 2009 RSFFA found out the true intent of the sunset clause. Negotiations that year became contentious and the district’s representatives had delayed scheduling a teacher-requested third bargaining session. When the RSFFA negotiating team did not hear from the District by the end of the school year, they sent a proposal for negotiations to resume in August. Ten days later the Superintendent responded in writing, indicating the district did not agree to wait until August, and that board policy 4111 would not be renewed if we did not agree to meet. A copy of the Superintendent’s letter is included in this link to the original story. At that point, teachers were in an untenable position and forced to sign a substandard contract to preserve the policy. In 2016 negotiations are again contentious, Board Policy 41111 is still in place, and there is great concern on the part of teachers that the district will yet again resort to this action. “Continuation of Board Policy 4111 “Enrollment of Children Whose Parents or Legal Guardians Are Permanent Full-time Certificated Employees of the District and Who Are Not Residents of the District”only upon ratification of a new agreement. The statement only reinforces the true intent of this sunset clause; It is to force our teachers to take any deal that keeps their children out of harm’s way. Using this policy as leverage creates pressure on the negotiating team to settle for less than what might be fair, and creates a rift between teachers with children at the school and those who don’t. Another teacher stated that using the policy in this manner has created a false deadline that hastens negotiations and encourages compliance over interest. RSFFA members want the sunset provision of 4111 eliminated. Educators in Rancho Santa Fe have dedicated countless hours to making RSF a special place and are invested in its present and future. It time for Rancho Santa Fe to make teachers a priority by honoring what they do, not dishonoring their families by threatening to dis-enroll a child if their parent can’t come to an agreement with the district.